All filters airflow arrow point toward the furnace. For conventional filters I recommend pleated filters which are changed every 60-90 days. The less expensive filter are typically referred to as fiberglass filters and are changed every 30 days. 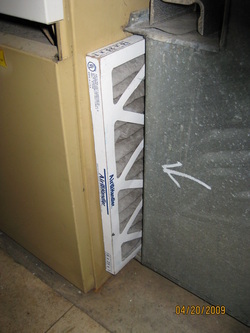 Here's what the epa recommends...."Change your air filter regularly. Check your filter every month, especially during heavy use months (winter and summer). If the filter looks dirty after a month, change it. At a minimum, change the filter every 3 months. A dirty filter will slow down air flow and make the system work harder to keep you warm or cool — wasting energy. A clean filter will also prevent dust and dirt from building up in the system — leading to expensive maintenance and/or early system failure." With a conventional filter I recommend the pleated 3 packs commonly available at Home Depot and Lowes for $8. Less filtration and too much dirt bypasses the filter and better filtration (based on the 1" surface area) and the filter causes too much restriction. 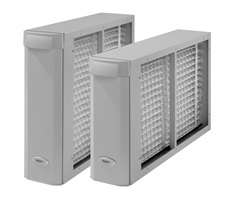 "Aprilaire 2210 and 2410 Whole-House Media Air Cleaners deliver the most efficient, cost-effective air cleaning for your home. " Ever feel as if all you do is clean your home? Installing a whole-home air cleaning system by Aprilaire means you'll need to dust less, keeping your home and its contents cleaner and more comfortable. Did you know that the build-up of dust and dirt can be damaging to your heating and cooling equipment contributing to increased and expensive maintenance or premature failure? A typical 1" furnace filter just can't provide enough protection. An Aprilaire Whole-House Air Cleaner helps ensure that your heating and cooling system lasts as long as possible. Click here to view 10-year old air conditioning coils with and without a whole-home air cleaner installed in the home. Build-up of dust, dirt, pet dander, hair and other substances on your heating and cooling equipment can reduce its efficiency by as much as 25%. An Aprilaire Whole-Home Air Cleaner can filter out these particles and help maintain the efficiency of your central heating and cooling system by enabling it to satisfy your needs quicker, using less energy." Turn Off When not in the Room -- Ceiling fans cool people, not rooms. If the room is unoccupied, turn off the ceiling fan to save energy. Using the Ceiling Fan Year Round -- In the summer, use the ceiling fan in the counterclockwise direction. While standing directly under the ceiling fan you should feel a cool breeze. The airflow produced creates a wind-chill effect, making you "feel" cooler. 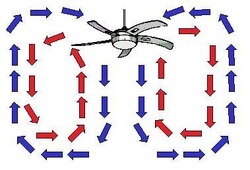 In the winter, reverse the motor and operate the ceiling fan at low speed in the clockwise direction. This produces a gentle updraft, which forces warm air near the ceiling down into the occupied space. Remember to adjust your thermostat when using your ceiling fan — additional energy and dollar savings could be realized with this simple step!